The Great British Baking Show's tense semi-final delivers picture-perfect "Patisserie"
It’s been a long road to the semi-finals. Each of the four bakers remaining has won Star Baker, and each has been up for elimination. The competition is fierce and they all know one small mistake is all it takes to send them home. The theme this episode is patisserie, or fine French pastry, and that means there’s nowhere to hide. Each of their bakes will need to be executed flawlessly and boast delicious, creative flavors for them to make it through to the final. The tone set by Mel and Sue’s wonderfully silly introduction is cast aside immediately and the air crackles with anticipation as the bakers enter the tent. First up is the signature challenge. The bakers must make 12 each of three different petit fours, each featuring a different baking discipline. These must be one mouthful, dainty and tempting, to truly qualify as petit fours and not a more generic dessert. As the contestants dive in, Mel explains in voiceover the history and etymology of petit fours, delicacies 18th-century French chefs would bake after dinner using lower oven temperatures. This challenge easily could have been stretched into a showstopper, with a simpler bake assigned as the signature challenge, and Mel’s voiceover could have easily been extended into a lengthy historical segment. However the judges aren’t messing around with this semi-final (and thankfully, neither are the editors). They want flavors and finesse all weekend, and the bakers rise to the challenge. James makes chili lime raspberry macarons, lemon and rhubarb tartlets, and what he calls “Chocolate Indulgence” (a brownie stacked on chocolate mousse stacked on a cookie). Danny makes blackberry and peppermint macarons, raspberry and basil financiers, and a chocolate-dipped cookie called langues de chat (or cat tongues). John makes lemon madeleines, white chocolate and raspberry tartlets, and dark chocolate and cherry macarons. All of these sound amazing and look delicious. 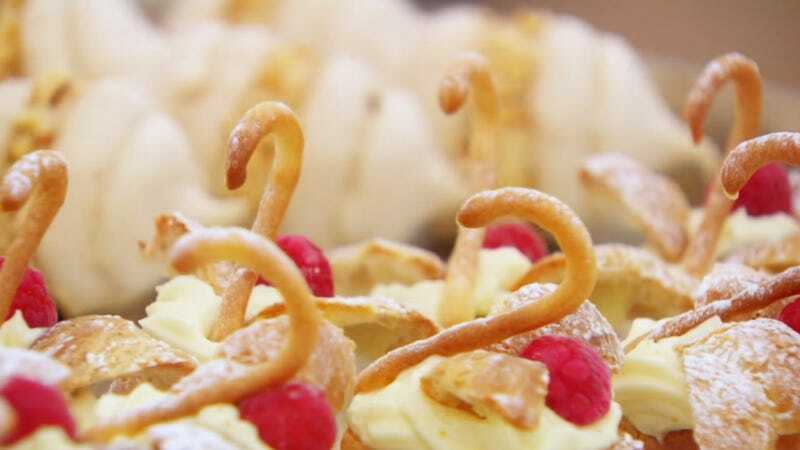 But it’s Brendan who goes above and beyond, with his coffee meringues with hazelnut cream, apricot and pistachio friands, and lime curd choux pastry cygnets. Brendan talks about being a perfectionist, and this making him rather challenging to live with at times, but that fastidiousness serves him well here. Much as Paul may not like to admit it, neither he nor Mary can find fault with any of Brendan’s petit fours. They’re good on texture, flavor, and size, and Brendan’s delicate cygnets are among the most visually stunning bakes all season. Meanwhile, James receives excellent critiques for his admittedly “rustic” offerings, Danny does well, other than a difference of opinion with Paul on the flavor combination of her macarons, and John misses the mark. For the technical challenge, the bakers must make a fraisier, a celebration cake consisting of a genoise sponge sliced in half and filled with a decorative layer of sliced strawberries and thickened crème pâtissière (pastry cream), with chocolate and marzipan decorations on top. As far as technicals go, it’s pretty straightforward: Make a cake, make crème pat, and layer ‘em with strawberries in the middle. However, at this stage of the competition, the judges aren’t looking for okay or even good; they’re looking for great, and for the technical challenge, that means the recipe doesn’t say much more than my previous sentence. Everything comes down to execution and the tension that diffused briefly when most of the bakers’ petit fours came out well is back with a vengeance. Rather than walking around and interacting with the bakers, Mel and Sue stay out of their way, talking to each other and checking in from afar on each of the contestants. It’s clear from their exchange how much they’re rooting for all four semi-finalists and their back-and-forth is incredibly satisfying, perfect audience surrogacy. The bakers are all familiar with each aspect of the recipe, with one exception. The fraisier needs to hold its shape when out of its pan, so the crème pat needs to be thickened with cornstarch. The editors make sure to include clips of most of the bakers raising an eyebrow at this step in the process, but it’s Danny who struggles the most with her pastry cream and when it doesn’t set, her fate is sealed. On a less competitive episode, this wouldn’t be enough to send her home. Every other element of her fraisier is well executed and tastes delicious. However at this level, as each of the bakers have said, one mistake is all it takes, and suddenly John, who had the roughest critiques by far during the signature challenge, has a fighting chance to avoid elimination. Brendan’s cream is a bit soft, though nothing like Danny’s, and his genoise is a bit dense, earning him third place, but John and James both do well, with James just edging John out for first place. The next morning arrives with weight and consequence. The bakers have one more challenge, one more chance to earn their spot in the final. For the showstopper challenge, they must make a choux pastry gateau. As Sue describes in a helpful bit of voiceover, choux is part batter and part dough, a very specific and delicious form of patisserie that requires, as every bake has this episode, precision and finesse. Brendan, Danny, and John opt for a gateau St. Honoré, a choux disc with a ring of pâte à choux attached to the top with caramel and filled with flavored cream, fruit, and other treats. James chooses a Paris-Brest, a circle of choux sliced in half and filled with cream or buttercream and other goodies. To compensate for his simpler recipe and give it that showstopper feel, he’s making two wheels instead of the traditional one and connecting them with a choux pastry bike frame, giving his bake a sense of whimsy and fun. Though each of the bakers is working towards a distinct flavor profile, the process for these showstoppers is very similar, and with tension inside the tent at a fever pitch, it’s a relief when the episode cuts away to a historical segment on St. Honoré, the patron saint of bakers. Sue’s stroll through Paris and her attempt at piping the gateau St. Honoré’s traditional crème chiboust are charming and relaxed and the segment lets the audience catch their breath. Before too long, however, we’re back in the tent, Mel talking John down after his bake starts to go awry and Danny determined to execute a perfect crème pat for her showstopper, to make up for her soupy technical. In the end, Brendan delivers a beautiful and tasty traditional gateau St. Honoré, James pulls off his Paris-Brest bicycle with aplomb, John brings lovely flavors to his passionfruit St. Honoré, but alas, Danny overdoes it with the rosewater in her lovely and well-baked, but unbalanced rosewater, raspberry, and lychee St Honoré. Paul and the producers try to make it seem like it’s anyone’s game, but with her mistake in the technical and one or two missteps on flavor, it’s not surprising when Danny is eliminated. More controversial is James’ awarding of Star Baker. There’s a distinct sense that the judges are bored with Brendan, who has been very good most of the season. His technical definitely flagged behind James’, but considering his exceptional petit fours, it’s hard not to feel he was robbed, the judges rewarding James’ risk-taking over Brendan’s consistency. He’ll have one more chance to prove his mettle, however, as The Great British Baking Show wraps up the season with its first ever all-male final. For now, let’s hear it for Danny! Queen of the ICU, the kitchen, and our hearts. After a season full of interesting and creative bakes from a tent full of charismatic and talented bakers, it would have been hard to say goodbye to any of the final four contestants. Yet there’s something in Danny’s poise, warmth, and perspective that makes it particularly difficult to watch her leave and her poignant final thoughts ensure she’ll be well-remembered by fans long after this season ends. I was surprised to find myself incredibly emotional about Danny’s comments after the technical. She chides herself, “Oh, you stupid girl” and hearing this badass, smart, capable woman infantilize and tear herself down, particularly with such gendered language, was heartbreaking. It shows how deeply so many of us internalize societal messaging on gender. Plenty of men on this show give themselves a hard time; they don’t call themselves little boys. Related: One of the most affecting aspects of The Great British Baking Show is getting to see people celebrated for the often overlooked and underappreciated (and traditionally “women’s”) work of home baking. Danny’s closing comments are a prime example: “I now know how much the people around me value me, and I think that’s pretty cool.” We think you’re pretty cool, Danny! During the judging for the signature challenge, we see James taste one of his macarons, and it occurred to me that that’s the first time I can think of one of the bakers actually getting to taste and enjoy one of their final bakes on camera. It’s nice. John, what are you doing, bringing up mucus? Don’t give the judges that kind of ammunition! It doesn’t help you to communicate that you’re aware of the problem if you exacerbate it with super gross imagery. Two fun Brendan moments: Him managing to let Sue put in that cygnet neck and his delightful pause, mid-technical, to take a sip of tea. I can’t be the only Outlander viewer who heard fraisier cake as “Frasier cake” and immediately thought of Mrs. Fitz, covered in flour and furiously whisking crème pat. The Great British Baking Show tests technique with its tricky "Biscuits"